Optimism and rejuvenation are the themes for the day. Active generosity and compassion come easy so don’t hold back. Give and you will receive. Embrace the Universe’s capacity to provide you with what you need when you need it most. 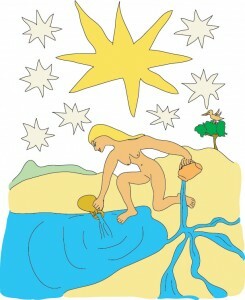 That’s what miracles are and the Star is the goddess of miracles. If things have been tough lately, now’s a time when you can finally lean back and take a bit of a break. Surround yourself with as much beauty as you can. It will help to replenish your soul. Art, music, and the glory of the night sky are all worthy subjects of meditation. Let them fill you with the inspiration you need for the next leg of your journey. You are currently reading Tarot Card of the Day – 11/30/10 at The Tarot Room.